I recently saw some slick ads for a newly published horse book -- I won't mention the title (for reasons you'll hopefully grasp), but it's being marketed as a groundbreaking, controversial, and unblinking exposé on the horse world. It's geared to the newly minted equestrian -- adult riders, parents of kinds who are begging for lessons, etc. Intriguing, huh? I was interested enough to investigate. I found some online excerpts from the book, and went through a healthy sampling of passages. Here's a very brief excerpt that seems pretty representative. The author is giving advice to a newbie parent/adult rider going out to visit lesson barns before making a final choice. Before you go, think about your appearance. You are being judged the minute you pull into the driveway. This can work as an advantage at first if you have a very nice, expensive car. You will get treated much better than if you pull in with a beater. (Yes, rich people drive beaters and poor people drive Porsche's [sic]; however, barns and trainers can be much more superficial than that. If you have two car options, try to pick middle of the road. You are being sized up -- jewelry, clothing, vehicle, everything is being analyzed to see how much money you have. The less they think you have, the less important they perceive you, but the less chance you have of being screwed (right away). Really? Whose reality is this? To me, this passage says a lot more about the author than the subject. Is everyone really out to "screw" the newbie equestrian? I think not. In my experience, barn managers/instructions don't pay that much attention to the circumstances of new lesson clients -- they're busy people. I suspect they are too wrapped up in their daily work to care about the means of conveyance for every prospective client. Besides, an expensive car is no guarantee that bills will be paid on time (in fact, the reverse may be true). This "car talk" passage stuck out as both off-the-wall AND off-putting AND inaccurate. The rest of the book reads like a last minute term paper, something rattled off and never revisited for accuracy/grammar/clarity. In a section entitled "Buying a Bridle" the advice offered is to get the $40 over the $400 bridle because "they work just as good [sic]." That's it. Hmmm. What about durability? Safety? Suitability for the discipline? Fit? Proper grammar? I could go to a stable and ask any 17-year-old barn rat about buying tack--they could tell me the same, if not more, than is offered here. Everyone feels they "have a book in them." A lucky few, like The Dressage Chronicles write Karen McGoldrick, really do. I've seen first-hand the amount of work, and research, and effort real writers put into their successful novels, and how-to guides, and works of scholarship. The best writers agonize over each passage. They fact check. In general, they struggle to make their book the best of its genre. It toasts my buns a little to see our sport represented in this way. It's a tiresome to see opinion-presented-as-fact, targeted to the least experienced/most unsuspecting in our sport, with significant grammatical errors never mind review/revision. The bulk of the effort here seems to be in the marketing. Writing, and books, and horses are all important to me. Even gifted writers edit and labor over their craft. Nothing like that happening here, and reading what's passing for expert advice just hit a nerve. I have somehow missed discussions of whatever this book is. However, I find it ironic that it is a "save yourself from the money-hungry talentless schemers" when that appears to be what the book itself is. There are plenty of dishonest horse people out there. Perhaps it's my luck in riding with good instructors which has me less wary, or just that I'm not out to cheat people out of their money, so don't expect them to do it to me! thanks for your thoughts- i've read your blog for a long time and love it. keep on keeping on. Well. I have not heard of/about this book, but I'll tell you right now, I am disgusted, for all the same reasons as you. It sounds like a blatant attempt to extract money from newbie horse people, so yeah, the irony is pretty rich! I won't read things with crappy grammar, period. Wow, talk about blind leading the blind. Maybe it's just I'm more aware of it since I spend more time on horsey boards and talking to horsey people but it does seem like the horse world is chock full of amateurs (in the lay sense of the world) who love to preach like they're experts. Maybe it's the glamour associated with riding that attracts these self important types? Anyhow I'm glad we have great blogs like yours to show that a true horse person expresses their well founded opinion so people can then form their own views rather than taking a dogmatic approach like this person and some of the training/riding systems I've seen aimed to take advantage of newbies. I know what book you are referring to, and while my horse life has been vastly different than the author's I do think she writes in an abrasive but convincing way. Rather like the Fugly blog, and probably just as dividing to the audience (love it or hate it). I think the author is right, if you drive up in a fancy car to a sales barn the prices might jump up. But the real reason I won't be buying the book is that it is geared towards a newcomer (who doesn't want to be screwed I guess), not the person who has been riding for years. But yeah, some weird politics in hunterjumperland. "Ace that thing" anyone? No need to publish this. You have a typo in paragraph 7--should be writer not write. I just thought it was ironic when you are talking about editing. LOL! I would think this book will wind up in the hands of people who think that riding is elitist. And voila! here is the proof. I hope no one who is seriously interested in finding an instructor for themselves or their child stumbles across this. I'm actually a little disgusted by that passage. If that spiel about cars and looking rich is worthy of a book, I don't want to live on this planet anymore! I pity the poor people who buy that book and believe what it says. No wonder the sport has such a reputation with the uninitiated. Whenever I mention that I ride, people always assume my parents were rich, I got a pony every Christmas, or that I'm obbsessed with competition. None of the above is true. I'm a grammar hound as well. When people ask "How are you? ", I always reply "I'm well", instead of "good". Bleh. "Good" drives me bonkers. I once turned down hiring a big wig speaker from the Smithsonian because his bio writeup was full of errors. If you're billing yourself as an expert, put your best foot foward. Hopefully this author will re-think future book projects. I really think this can be true of any sport. There are the few bad applies out there that are out there for the love of money and not the love of sport. Those bad apples in any sport are assessing new clients to see how much money they have, etc. I have felt this way when visiting gyms & considering a membership. Oh wow. I think back to my experience teaching at other barns and at my own ... and, nope, can't say as that is the impression I would get AT ALL. To be 100% honest, if I saw a pleasant-faced lady drive up in an average car with a shy, little girl wearing what looked like her best rendition of cowboy boots (or whatever the family could afford with a low heel), my heart always warmed. These people were here because the little girl probably loves horses more than ANYTHING and dreams of a barn full of all kinds ... but can only afford the plastic models. She probably takes immaculate care of those models and even makes them little blankets. This type of rider will CARE about her mount and HANG on EVERY WORD you say as an instructor. This was my favorite type of student to teach. 80% of the time, when an overdressed woman and her disinterested, whiny child drove up in a "too clean to be at a farm" luxury vehicle, I wanted to hide in the hay barn. They may pay and be able to afford trainer fees at every show, but they are also most likely going to be utterly obnoxious, officious, and overbearing. Mark my words. I'll take the beater and the plainly dressed ANYTIME, and I don't need a book telling me otherwise!! I have years of experience to back up my claims. I know just the book you're talking about--even the title is badly written. I'm a writing prof so I know all about how much work/rewriting should go into work meant for the public...in this case, it is doubtful this crossed an editor's desk...its likely a vanity press release, and its quality reflects that. I once worked as a fact checker/copy editor for a large NYC publishing house. I received a manuscript on horse training, written by a veterinarian. The book covered training from ground work to the show ring. 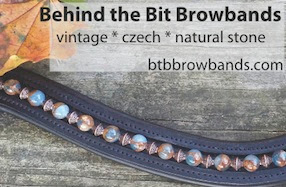 The section on bits went something like the one you mentioned on bridles. "Pick one. Any bit will do." I knew "trainers" who rode every horse in a Mona Lisa spade bit because they needed "control." Regardless of the age or experience level of the horse they were "training" or showing, they used that spade bit. I am not a trainer, but I knew starting a youngster in something as gawd-awful as a Mona Lisa spade was just wrong. So, I researched bits, asked trainers whose expertise I trusted, and wrote several paragraphs to fill out the section. The editor in NYC called to ask who had written the information. I said I had done so, "out of my head" (;o) She sent the paragraphs to the author and he called to thank me for the information I had provided. "I don't know that much about bits," he admitted. Another horrible horse book is still in print covers showing horses at halter. Haven't read it since I was asked to review it in 1975 or whenever it was first published, so maybe someone has "wised up" and deleted the parts I found so objectionable back then. The section on getting the horse fit said if your horse had a hay belly a few days before the show, withhold all hay until the show. And if the horse wasn't alert during the class, wait until the judge was looking the other way and "kick the horse in the belly." The author had written many articles for the magazine I worked for, and she and the publishers expected the review of her book to be positive. I passed the book to another assistant. Didn't read the review when it came out--my internship ended before publication. While there are a lot of unscrupulous people in horses (and dogs, cats, antiques, publishing, etc.) who aren't above taking advantage of someone who doesn't know any better, I think the person whose book you are critiquing isn't doing anyone any favors by her advice. If you don't know about horses, find yourself a trainer or horse savvy friend and have them go with you. Unfortunately books and people like that are the reason less kids are getting into riding and less parents are paying for lessons or encouraging riding. Wow, if everyone at the barn is out to get you as soon as you drive up, why go there at all? I'd hate to live in this woman's world. I'm not sure how I missed this book, but I'm not sorry! The book in question is self-published at CreateSpace, so I'm not surprised that it doesn't pass the sniff test. It didn't have an editor, and knowing just a bit about the author, I'm certain that person would not pay the money to hire one. As one of my editors used to say, "This project has bush league written all over it." In taking on a project (such as a book), it's so important to know your strengths. If it's biting/hater humor, go that route. If personal credentials are on the light side, leave the expert advice to the experts. And if writing something truly unique and insightful seems like too much work, skip it. BTW, looking for a lesson barn? Find a local horse council or dressage or hunter jumper association, or ask around till you find someone who can give you the scoop. Personal connections are everything in the horse community. Cars, not so much. After a life experience, writing on lyric performers, the only I suggest is to refer precisely mentioning names (title of the book) and specific points. Otherwise criticism doesn't enable readers to be protected as well as author to correct his mistakes in next editions. I *REALLY* want to read this book! Honestly, I do: I'm in the process of writing a book for beginners that, from this brief snippet, appears to be the OPPOSITE of this. Can you please send me the title/author by private email?